UPDATE: May 21, 2015. Goldman Sachs has just released an oil price forecast suggesting that North Sea Brent crude will still be $55 in 2020, five years from now. As Alberta’s Western Canadian Select (WCS) bitumen is valued lower on commodity markets this is extremely bad news for Canada. Further, the well-known Canadian economic forecasting firm, Enform is predicting that job losses across all of western Canada, not only Alberta, could reach 180,000. UPDATE: January 15, 2015. Target announced today that it will be closing all 133 stores in Canada, including the Vernon and Kelowna stores. eliminating at least a couple of hundred local $10/hr jobs and a handful of slightly better paid management jobs. The Wall Street Journal is reporting that Target’s 17,000 + Canadian layoffs of low-income workers will be the largest in Canadian history. 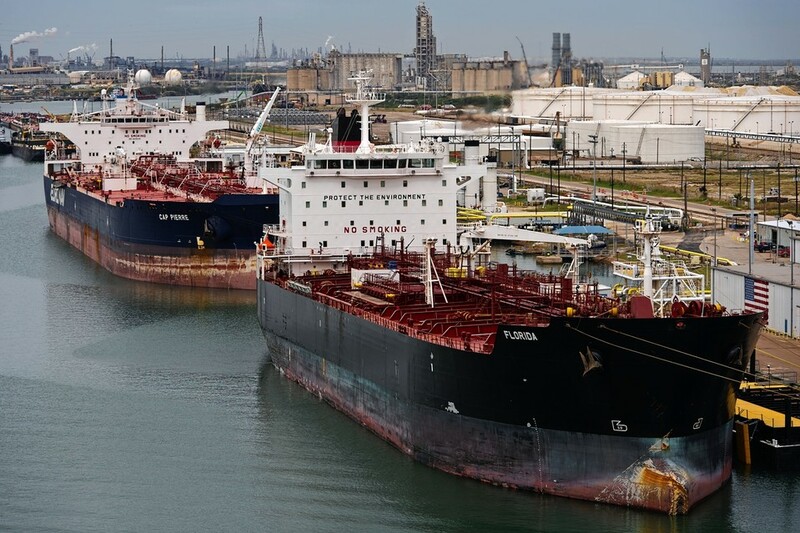 Oil tankers are loaded with crude in Corpus Christi, Texas, in December. The area has prospered in recent years due to the energy boom in the Eagle Ford shale formation, but falling prices could test that. Texas got its wish with another energy-driven boom, and now plunging oil prices are testing whether the state has held up its end of the bargain. The Lone Star State’s economy has been a national growth engine since the recession ended, expanding at a rate of 4.4% annually between 2009 and 2013, twice the pace of the U.S. as a whole. The downturn in energy prices now has triggered a debate over whether Texas simply got lucky in recent years, thanks to a hydraulic-fracturing oil-and-gas boom, or whether it hit on an economic playbook that other states, and the country as a whole, could emulate. One in seven jobs created nationally during the 50-month expansion has been created in Texas, where the unemployment rate, at 4.9%, is nearly a percentage point lower than the national average. But a big dose of the state’s good fortune comes from the oil-and-gas sector. Midland, which sits atop the oil-rich Permian Basin, had the fastest weekly wage growth in the country among large countries: 9% in the 12 months ending June 2014. Now that oil prices have plunged nearly 51% from their June peak to $52.69 a barrel, some Texans sobered by memories of past energy busts are bracing for a fall. The argument among economists and business leaders isn’t whether the state will be hurt, but how badly. Mr. Kelleher is among the Texans predicting this won’t be a replay of the 1980s oil bust and banking crisis, which drove the state unemployment rate to 9.3%. As evidence, he and others cite a more cautious banking sector, a tax and regulatory environment favorable to business, and a state economy less dependent on energy and other resources. Michael Feroli, a New York-based economist at J.P. Morgan Chase & Co., is one of the skeptics of the “this-time-is-different” camp. Although the oil-and-gas industry today makes up a smaller share of Texas’ workforce than it did in the mid-1980s, it accounts for roughly the same share of its economic output, he said. So a decline in oil prices similar to the plunge of more than 50% seen in the mid-1980s, he said, could have a similar result: recession. 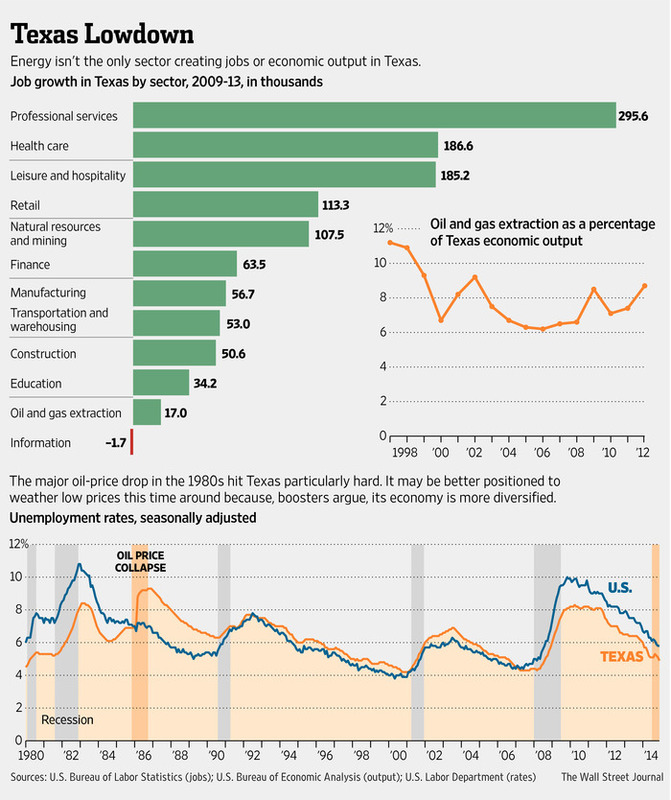 “If oil prices stay where they are, Texas is going to face a more difficult economic reality,” Mr. Feroli said. Oil exploration companies already are scaling back drilling plans for next year. Oil-field-service companies that provide labor and machinery, such as Halliburton Co. andSchlumberger Ltd. , are laying off workers. The number of oil and gas rigs in Texas, which had grown 80% since the start of 2010, has been dropping over the past few weeks. The rig count in the state stood at 851 at the end of December, down from 905 in mid-November, according to oil-field-services firm Baker Hughes Inc., which compiles the data. Meanwhile, yields on junk bonds tied to energy companies have soared as investors brace for financial fallout from the oil-price bust. Yet Dallas Fed President Richard Fisher likens the J.P. Morgan report to bull droppings. He noted that sectors including trade and transportation, leisure and hospitality, education and construction all have produced more new jobs in recent years than energy. Houston has experienced fast growth in the medical sector, Austin in technology. Analysts at the Federal Reserve Bank of Dallas estimate that a 45% decline in the price of oil—from $100 a barrel to near $55—will reduce Texas payrolls by 125,000, all else being equal. Payrolls were up 447,900 in November from a year earlier, or 3.9%. The Dallas Fed estimate implies growth of more than 300,000, or nearly 3%, even with a lower oil price, still faster than the national average of 2%. Pia Orrenius, a Dallas Fed regional economist, sees the price bust washing through the Texas economy in both positive and negative ways. It could help the booming petrochemicals sector and manufacturing by lowering costs. A construction boom centered on petrochemical plants is already under way along the Gulf Coast, a source of blue-collar jobs. Yet the price bust will hurt sectors like construction, transportation and business services that have expanded to serve the oil industry, and consumer spending more broadly as workers lose their jobs. “We will see significant spillovers,” Ms. Orrenius said. Nowhere is the evolution of the Texas economy more apparent than in Houston, the nation’s fourth-largest city, with 2.2 million people. After oil-and-gas prices crashed in the mid-1980s, energy companies in the city laid off thousands of petroleum engineers and other well-paid industry workers, and the real-estate market crumbled, helping trigger a regional-banking collapse. One in six homes and apartments in Houston stood vacant at the beginning of 1987, and the county tax rolls dropped by $8 billion, according to a history of the bust by the Federal Deposit Insurance Corp. That prompted civic leaders to push for an expanded medical sector and more diversified economy. Today, the Texas Medical Center is the world’s largest medical complex, with more than 20 hospitals, three medical schools and six nursing schools, employing 106,000 people. Health-care and social-services companies made up 10.4% of jobs in the greater Houston area in 2013, compared with 5.9% in 1985, according to Labor Department data. Roughly 4.3% of jobs in the county were in the oil-and-gas industry last year, down from 5.9% in 1985. Still, most of the 26 Fortune 500 companies based in Houston are in energy, includingPhillips 66 , Halliburton and Anadarko Petroleum Corp. , and energy employees flush with cash recently spurred a run-up in real-estate prices in the region that has raised red flags among some economists. Fitch Ratings recently declared that Houston home prices were the second-most overvalued in the country, behind Austin, when compared with historical averages, and that current prices may be unsustainable, citing the current oil-price drop. The energy boom has strengthened the state’s budget. Revenues are expected to take a hit with falling levies on oil and natural gas production, but less than previously. The levies accounted for 9.4% of state tax revenue in 2013 compared with 20.2% in 1985, according to data from the Texas state comptroller’s office. Texas banks also appear to be in better shape to handle a shock than they were in the 1980s. Between 1986 and 1990, more than 700 Texas banks and thrifts failed. During the worst of the last financial crisis in 2008 and 2009, seven Texas banks failed, according to the FDIC. Fewer than 1% of state banks have high measures of nonperforming loans now, compared with 20% in the late 1980s, according to the Dallas Fed. Texas is the only state that limits home-equity borrowing to 80% of a home’s value, a provision enshrined in its state constitution. The rule helped keep Texas homeowners from piling up debt against their homes during the national real-estate boom of the 2000s. Only 10% of nonprime mortgages were underwater in 2011 in Texas, compared with 54% in the rest of the U.S., according to the Dallas Fed. Texas has something else going for it: A bounty of resources other than oil and natural gas, most notably, land and people. The state’s population grew 29% between 2000 and 2014, more than twice as fast as the U.S. as a whole, according to the Census Bureau. The median age in Texas was 34 last year, 3 1/2 years younger than the nation overall. Growth has come from a combination of migration from other states, immigration and a higher birthrate than the national average. The U.S. economy has been restrained in recent years by slow labor-force growth. Texas, on the other hand, has more young people entering their prime working years and fewer elderly residents, as a percentage of the population, than does the nation overall. That has given its economy a solid foundation of available workers. Workforce and land were two factors that drew Firefly Space Systems, a manufacturer of low-orbit rockets, to the Austin area earlier this year. The firm needed a place to launch test rockets and chose Texas over Los Angeles for an expansion. It found a supply of tech-savvy workers in the Austin area and plentiful land. “It was the geography, and it was making sure our employees were comfortable there,” said Maureen Gannon, the firm’s vice president for business development. The firm plans to hire 200 people in coming years. ← Here’s How To Get A Job At Facebook….